"For those of us who still think a good peanut butter and jelly sandwhich is manna from the heavens, Kathleen Robinson's entry into the contest is especially heartbreaking - individually wrapped peanut butter slices. Obviously, individually wrapping each "slice" of peanut butter creates quite a bit more packaging than a simple jar would. 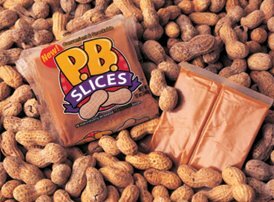 However, Kathleen thinks she may have an even better idea, "It seems to me the inventor of this "unsticky" peanut butter could have simply sold his peanut butter in blocks, like cheese, that could be sliced with a cheese cutter (creating even less waste than a regular peanut butter jar?). Consumers could maybe even use a cheese grater on a block of peanut butter, creating shredded peanut butter, which I imagine would be good for cookies, or icecream." We're still not sold on "unsticky" peanut butter, however Kathleen's block o' peanut butter looks much better than a pile of plastic any day. Check out the picture after the jump..."
The different comments from Gizmondo and Treehugger blogs are obviuos, the Gizmondo ones are more happy to find out where they are sold, caring zero to nothing about the whole idea of the packaging waste headache(not all though!) and Treehuggers are criticizing more the packaging problem in our shops and bins.